Dartmouth is an historic Devonshire port situated some 27 miles (56 km) south of Exeter. It sits on a steep hillside on the west bank of the River Dart estuary facing a deep water harbour which ensured its nautical importance from the earliest times. Ships sailed to the Crusades from Dartmouth and it has been a home to the Royal Navy since the days of Edward III. In later times, the harbour was a departure point for American troops destined for Utah Beach during the D Day landings. In its lower reaches, the River Dart slides gently between softly wooded banks and is a stunningly beautiful place to be on a sunny day. At high water the river is navigable up to Totnes, to which there are many boat trips available from Dartmouth quay. The most picturesque spot in Dartmouth is Bayards Cove, an old cobbled wharf which was once the only landing place in town. At the southern end is a small fort built in 1510 to protect the landing. It is another one of those places from which the Pilgrim Fathers are said to have sailed in 1620. The quay may seem familiar as it was often the quayside backdrop for the 1970s TV series the Onedin Line. Today, Dartmouth is a charming holiday destination, its narrow lanes and flights of stone steps leading up between Medieval and half-timbered Elizabethan buildings lend a timeless air to this preserved snippet of old England. There are many notable old buildings such as the 17th-c Butterwalk, where King Charles II held court in 1671 while he was holed up in port during a storm. The oldest building is a former merchant's house built around 1380 and now a pub called the Cherub. The safe harbour remains a haven for yachtsmen and visiting ships. The embankment that fronts the whole town was built with the help of prisoners from the Napoleonic wars and is now an ideal spot for boat and people watching. The village of Kingswear lies just across the harbour from Dartmouth and can be reached by ferry. From here the Paignton & Dartmouth Steam Railway runs a regular service to Paignton along a scenic stretch of track. The remains of a circular Tudor stronghold, built to defend the Dartmouth harbour. Run by English Heritage. Dartmouth Castle is a coastal fort built to defend Dartmouth harbour in conjunction with Kingswear Castle just across the narrow harbour mouth. The two castles were linked at night by a massive chain following French attacks during the Hundred Years War. Dartmouth Castle was built back in the 15th Century and is said to be the earliest surviving coastal artillery fortress in the country. The castle has two linked towers, one round and one square and is built on a rocky promontory just above the waves. 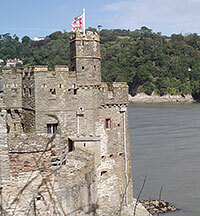 Dartmouth Castle is run by English Heritage* and open to the public; Kingswear Castle is owned by the Landmark Trust, and is not normally accessible to the public. This is a working example of a 1725 atmospheric steam pumping-engine, a memorial to the Dartmouth-born inventor, Thomas Newcomen. The Britannia Royal Naval College is an impressive sight on its dominant hillside just up river from Dartmouth. Officers are trained here for the British and some foreign navies. The Greenway estate is the former home of crime writer Agatha Christie. It is now National Trust owned and open to the public. The house enjoys glorious views of the river and can be reached by ferry from the village of Dittisham.